Instead of celebrating their usual Friday bash they moved to Saturday to welcome Jan Delay at Neidclub. The German Hip Hop and Pop star made a call on to introduce his brand new longplayer Wir Kinder vom Bahnhof Soul. This time he delivers his fresh Soul and Funk anthems on the turntables without his band Disko Nr 1 as the Club seems a bit too small for a Funkband with 10 members. 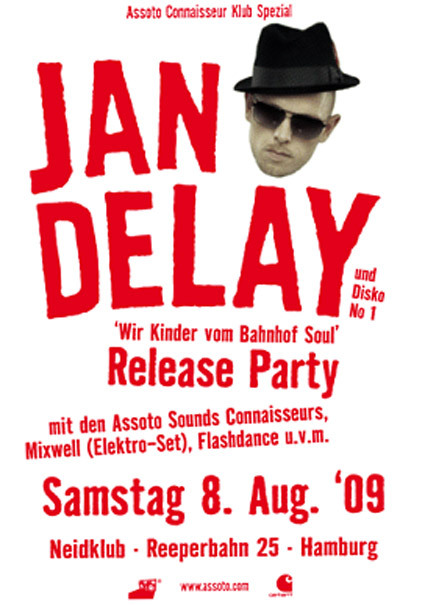 Beside Flashdance, the pseudonym that Jan Delay uses as a DJ, also the Assoto Sounds Connaisseurs, Fukkk Off and Mixwell will play.